11. Place the folded ear into the seam – the bottom edge of the ear matching the edge of the side with the fold in the back. 12. Continue to sew the seam – going through all four layers – the side, the back and the folded ear. 13. Continue to sew the seam – following the curve and carefully match the edges as you sew. Knot at the bottom of the back – it should meet the bottom of the center seam. 14. Begin to sew in the other side of the back piece to the other side piece. After inserting the ear sew about 1/2 inch further and stop and knot. 15. Sew the seam up from the bottom – leaving a gap of about two inches for turning and stuffing. 16. Turn your mouse right side out and stuff him – be sure to push his nose all the way out and fill in his round parts. Fold in the edges of the opening and whip stitch closed with matching thread. 17. Place the arms on the chest a shown. 18. Place the tummy oval over the arms and whip stitch in place. I’m using a gray thread to match the body color. When you reach the arm fold it over and stitch through. 19. Embroider very simple features ( I’m using black DMC 8 pearl cotton). A V following the seams of the nose and three little stitches below for the mouth. Add a cluster of two or three tiny stitches for each eye – they don’t need to be perfect circles – a little irregularity will add personality. You can find a video tutorial demonstrating a nifty way to hide your knots here. 20. Cut a thin and tapered strip of felt for the tail – twist it between your fingers to soften the edges and curl it. 21. Stitch the tail to the bottom. 22. Place the little feet on either side of the tail as shown and tack on with a couple stitches. I hope you make some very nice mice! If you do I’d love to see – email photos to ann at ann wood handmade dot com. Thank you Ann, this is such a sweet pattern! This is so generous of you! I will look forward to making some for my Mom and daughters… perhaps set them around their houses secretly ( in a cupboard, or peeking out of a slightly open drawer) to find during the Holidays. Thanks so much for the cute mouse pattern. Can’t wait to make it! So sweet!!! Thank you for this special pattern! Merry Christmas to you too and thank you for sharing your delightful whimsy. Wonderful – I do like a bunch! I named mine meanie mouse because she was IMPOSSIBLE 2 make! These are so cute, Ann. 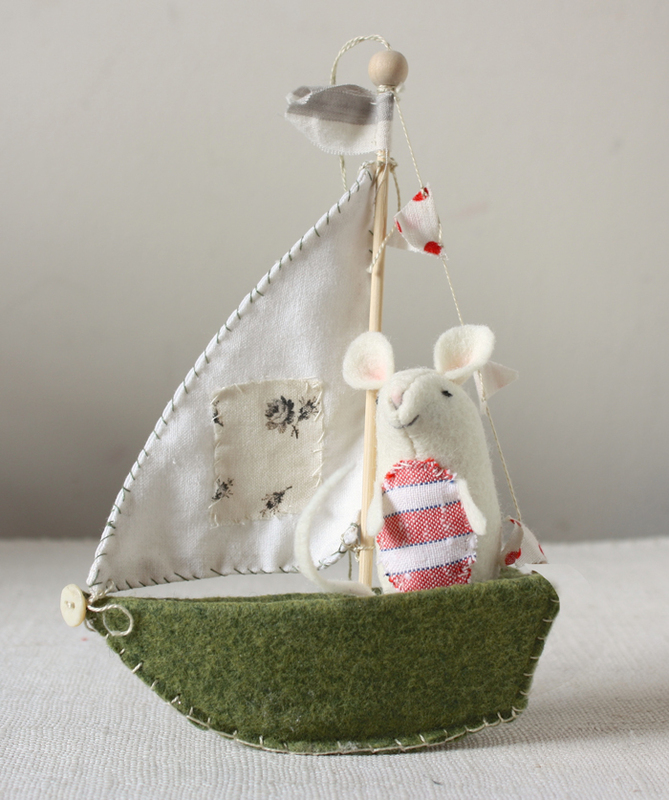 I’ve just purchased your little felt boat pattern so they will have safe voyages on calm seas! Merry Christmas! What a treat to find your sweet pattern gift in my Inbox! Thank you Ann! Merry Christmas to you too! thank you, dear wee creatures! Thank you so much! Looking forward to making a herd of mice…or is it a flock…lots of mice! In this world full of violence, hate, doubts, you offer a moment of innocence, peace aud poetry ; always a pleasure. Thanks! Your mice are darling …. thank you for sharing. Oh, Ann…Thank you so much for this beautiful little creature. How generous of you to share such a nice Christmas present. May you have a very happy holiday season and a prosperous 2016. Ann…I just made my first mouse and it’s so adorable. The instructions are so clear and well written. Thank you for offering these free tutorials and even links to all the tricks and tips. Your website and work inspires me! Thank you, Ann for this delightful pattern. I’m just getting ready to start my first that will, hopefully, be followed by many more …. I have great ideas for these creatures. You’re a sweetie to share this with us. Thank you, Ann. These are the sweetest little mice! You are the best! Thank you so much for this little cutie – I know I want to make a few for little Christmas gifties next year! Every year I do a series of ornaments for my friends and, after 36 years of doing so, it’s harder and harder to come up with something that is different. This fits the bill perfectly! Thank you Ann for the adorable mouse pattern. A Merry Christmas to you and yours. I just embarked on making a mouse … out of flannel (! ), so my question is: if the fabric has a pattern (or a right side and wrong side) do you need to reverse the pattern when you cut the two side pieces and sew them wrong sides together? The flannel is a no-go – it frays too much. Now I have another question – I think my mice are ending up built upside down…they *should* sit nicely, right?? Ooops, my felt yarmulke project just got diverted… Bring on the mice! Much Thanks, Ann for this adorable pattern! Smiling. Thank you for sharing your art and skills. A Christmas mouse and friends are most welcome . Wishing you and yours a wonderful Holiday Season too. Your work and life is most intriguing.I love reading your blog and imagining you and New York and wonderful Brooklyn! Lovely little mice! !!! Lovely pattern, didn’t take long and I now have the first of many sweet little mice! What cute little mice! They look fantastic. I especially love the way you’ve got one of them captaining the boat! The little mice are so cute. I plan to make them into Christmas decorations for next Christmas. Love your tutorial. I made my granddaughters ladybugs last spring and they were not easy. I almost quit in the middle but glad I didn’t – they loved them. So now I will try the mice – and your instructions look great! Thanks so much for sharing! These are so cute! I can’t wait to try them. Do you think it would work with fleece? I have a ton of fleece and no felt at the moment, so I’m looking for things to make with fleece. Thank you! Thanks so much for your generosity, Ann in sharing your pattern and ideas. Much appreciated. How can we possibly print up your mouse pattern without saying a massive “THANKS”!! … For the free bit. But even more for the cuteness, unageing and simple design of these cheeky mice. I live in France and a little bit of Anglo tradition warms the heart. You do some brilliant ‘stuff’ Ann. Well done! Thank you for the cute mouse!!! It is so cute!!! Greetings from Tasmania. Thanks Ann. Am making one this weekend – they are lovely. Thank you for the pattern and all that you do. So nice mouses!!! Thank you so much!!! Thanks so much for your pattern. I love the little mouse and have enjoyed making them. Thank you Ann, I so enjoyed making a little grey mouse today! She is adorable, I hope to make the rest of her family soon. My first attempt at making a soft toy and she is such a success. I adore your beautiful work. I am fairly new to sewing and I am getting lost in a specific part of the instructions. Once you get to the part where you are supposed to turn the mouse right side in and stuff…how do you finish those last 2 inches or so now that the mouse is right side in? Aren’t you going to be stitched from a different side leaving the seam to look different? Does that make sense? Visualize – or even look at a seam that is already sewn. See the “wrong” side, and see the “right” side. See how the wrong side has the raw edges just a bit away from the thread stitching? Now, visualize the seam that you have to finish, but not in the normal way of stitching a seam, because you’re sewing it from the right side, rather than the wrong side. Basically, you want to fold both pieces of fabric that need to be sewn together, from the right (printed side, or the side that will show, rather) side of the fabric, and place them side by side, touching each other, as if there truly is a regular seam in place. Now, whip stitch, placing your needle through the fold of one side, then the other. Thank you so much for taking the time to design and craft this unique project. Do you think these would be safe for my cats to play with? That is the first thing I thought of when I saw these. It would be fun to make toys for them. Hi Cathie – I think it’s best to make that decision on an individual cat basis. Thank you for sharing this sweet pattern. I like making cat toys for the Vet. clinic to help other animals. I LOVE your sister’s bunnies and look forward to popping a few in some easter baskets!! Thanks for this gorgeous pattern, just made one for my son and it turned out great! Elles sont ravissantes ces petites souris. Bravo ! Merci pour le partage. thanks for this pattern, i will use it to make 7 colored mices for the 7 days of the week in the steiner waldorf class of my daughter. Thank you so much for these sweet mice. Looking forward to sew and stuff them with lavender seeds. I can’t help but giggle as I am sewing. thank you !! Thank you so much is really nice!! So cute! Thanks for the free pattern and tutorial! Very sweet! I have several started. Am I missing a key instruction? How do I close up the back after stuffing? I’ll go back and read through again. Enjoy the winter landscape out there! As you can see I’ve adapted the arms and feet, but kept the original design in the body – it’s just perfect! 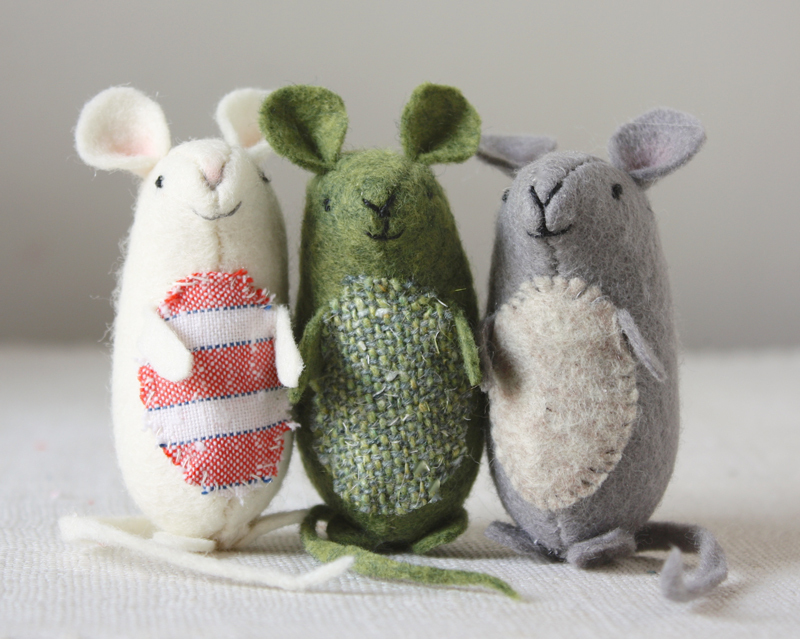 I made some little mice a few months ago, and I think they might need to meet their cousins! I am going to make some of these to go with the other little critters I am obsessed with making. I will share pictures of the “family reunion” when I get that done! PS – I got here through a link on All Free Sewing. Monisimos estos prqueños personajes Mil.gracias! Pingback: 33 Super Cute Felt Toy Patterns Your Kids Will Love to Play With! Hi Elena – that is super sweet!! I bet she loved it. Hi Rebecca – Sure you can leave the tummy open instead if you prefer. In testing I found it took away some roundness so opted for the back/side seam. Good luck with your mobile! Thank you for such a delightful pattern, I made a trio for my son for Christmas and had so much fun making them I’ve now made a dozen for little Christmas gifts. I’ve never felt confident with hand sewing projects but this has inspired me along with a lot of your other creations. I’m excited to create some hats, aprons and other accessories for my little army of mice.